Autumn has arrived. The leaves are falling, the nights are cooler and I have returned to the kitchen. I love a cozy Sunday afternoon in a warm sweater and thick socks, the football game on in the background, an aromatic pot of chili bubbling away on the stove. Not just any chili though. 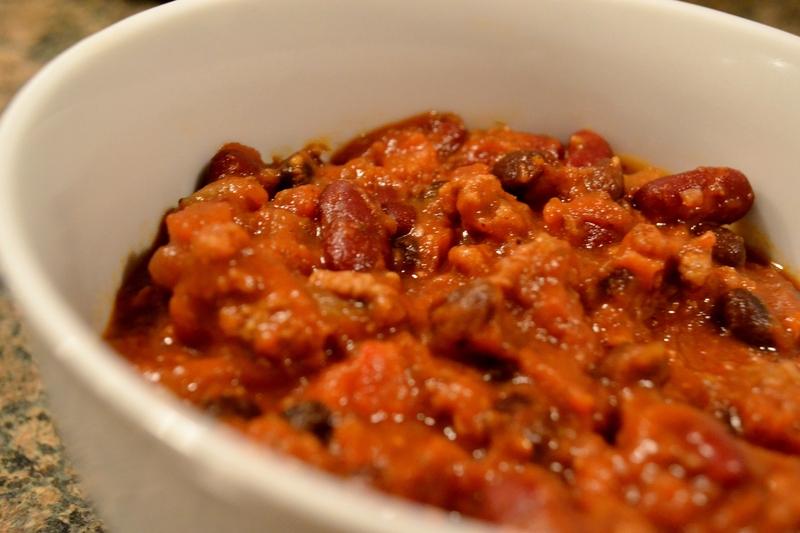 This chili recipe has been a long time in the making. It wasn’t until last year that I finished it’s fine-tuning. I knew my work was done when Brad, the in-house chili connoisseur, started to request it with an almost annoying frequency. (I’m telling you, the man LOVES chili). A few unconventional ingredients pack both flavor and nutrition. Pumpkin puree provides a luxurious mouth-feel and ups the beta carotene and fiber by a mile. Unsweetened cocoa supplies a blast of antioxidant power while adding a surprising depth of flavor. A heaping scoop of chia ensures a healthy dose of calcium and the many herbs and spices double up on antioxidant power and taste. In addition to all that, this dish is full of fresh veggies and hearty legumes. It makes a wonderfully nourishing meal on a blustery fall day. This recipe can easily be adapted for vegetarians, vegans and meat-eaters alike. As always, CSA ingredients are in bold type. This entry was posted in Soups, Chowders & Stews and tagged antioxidant, chili, CSA on October 7, 2013 by Megan.